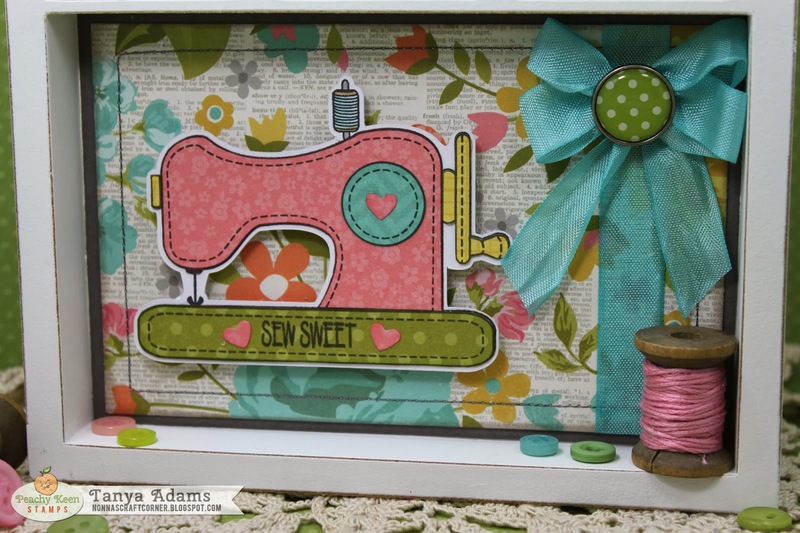 * Printed Papers - Simple Stories "Vintage Bliss"
I did a little machine stitching in dark gray thread around each of my background mats. 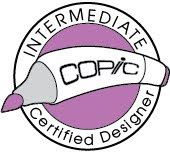 I used paper piecing for the sewing machine and pin cushion The spools of thread are colored with my Copic Markers and the scissors are colored in with an Atyou Spica Glitter pen in Silver. I added a few buttons, a spool of thread and a couple of straight pins to the edges of my shadow box for the finishing touches. 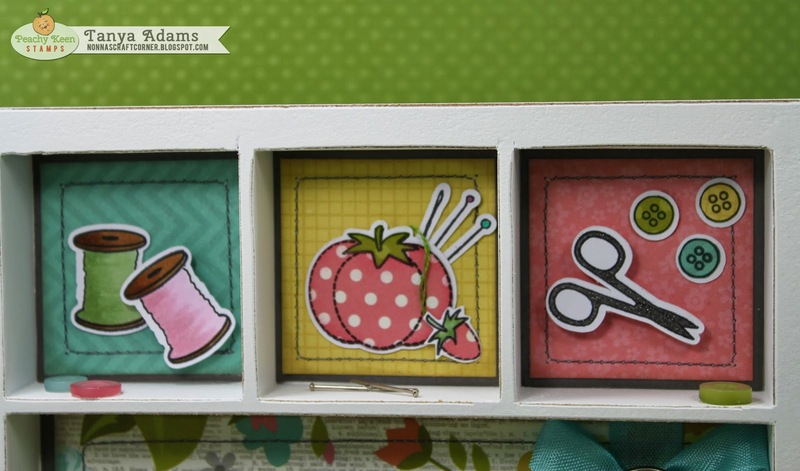 Thanks so much for stopping by today - be sure to stop by the Peachy Keen Stamps Blog to see what the other Designers have put together for your inspiration. Join us for sneak peeks of the new stamps throughout the day on Tuesday, November 5th! It all leads up to our BIG Release and Reveal at 6 p.m.. We'll party throughout the day with chances to win prizes, and we'll have some wonderful challenges for you to play along with for a chance to win as well! We'd love for you to join us for all the FUN! 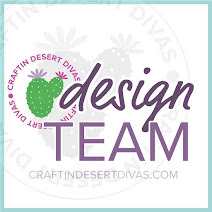 Our DT has some super cute creations to share and of course there will be challenges and prizes, too!! You can join the party by clicking here. What a fun project! 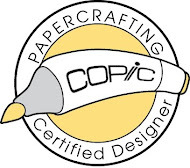 This would make a great decoration for a sewing room. It's so adorable! This is "sew" AWESOME!!! I totally LOVE this Tanya! Super fun and adorable! Sew pretty!!! Love the colors! Those old spools are so cool! Love it, Love it, Looooove it!!! So (sew) pretty!!! Love he colors!! I love this, Tanya. If I had a sewing room I would want this in it. This is wonderful!! I'd love to make something like this for my mother!! Loving the sneak peaks of this set!! What a cute Shadow Box. 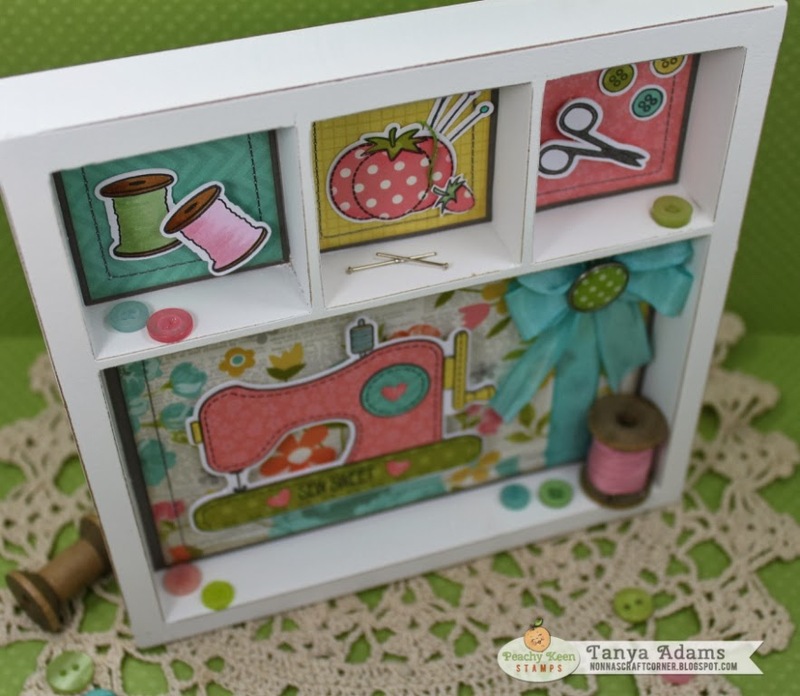 Love the papers, stamps and adding the thread was a perfect touch. Would be perfect for any craft room. This is so sweet, I really love the colors and the papers that you used, they are so cheerful!! Tanya this is so amazing! Such a lovely work of art! I love it! 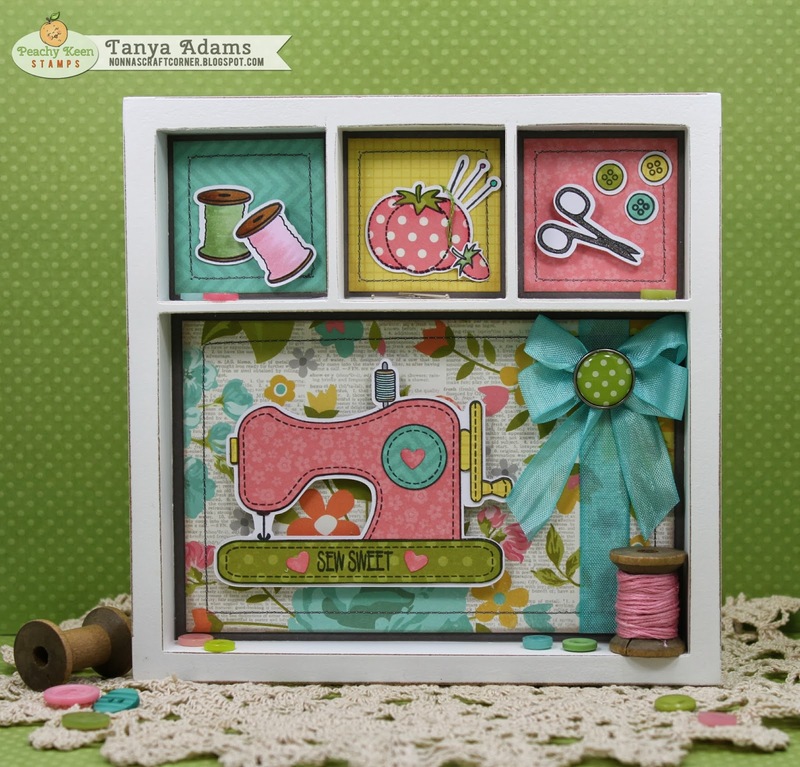 Tanya, what a FABULOUS shadow box! It is filled with so many adorable images! 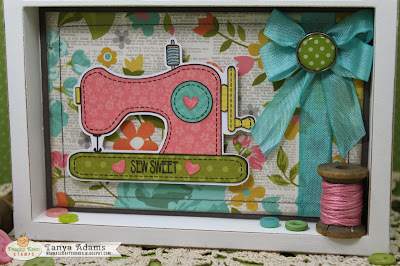 I just love all the fun papers, stamping and beautiful bow. 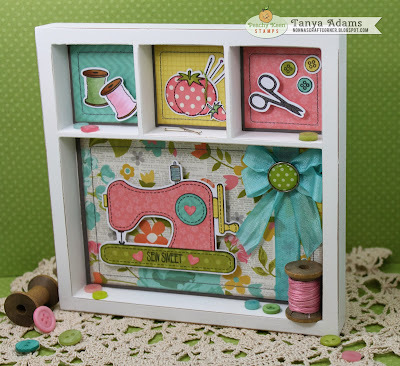 What a fantastic Hom Decor piece for a sewing room! Adorable my friend! Tanya ~ If the recipient does not want this I will TOTALLY take this off your hands! LOL! I LOVE it and seriously the details are simply AMAZING!!! WOW! You rocked this! This is Absolutely beautiful! 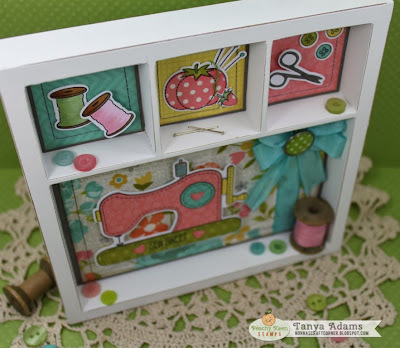 One of my favorite crafty projects that you have made! LOVE it!